Book is a detailed look at over 70 of the most significant and successful fighter and attack aircraft ever produced, from the Sopwith Camel to the Lockheed Martin F-22 Raptor. Includes 600+ photographs and artworks. 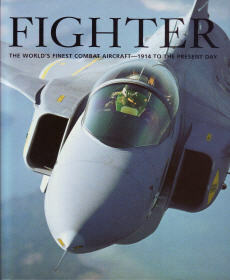 Book is an invaluable reference guide to the world’s most spectacular combat aircraft. Contents Include: WWI, Between the Wars, WWII, The Early Cold War, The Late Cold War, Modern Fighters. Index. This is a beautiful large coffee table size book on military aircraft from 1914 to present day. .